WASHINGTON — When President Donald Trump spoke critically Tuesday of an arms race that was getting “out of control,” he wasn’t talking about the one U.S. officials fret is gaining steam in the Middle East. But the comments, ostensibly aimed at Russia, were delivered alongside Saudi Arabia’s crown prince, whose own recent statements have raised concern among U.S. officials of an arms race between Iran and its regional foes. Trump on Tuesday welcomed Mohammed bin Salman on his second visit to the White House — the first stop in the young Saudi royal’s U.S. tour, which includes meetings in Silicon Valley, Los Angeles and Houston. While both U.S. and Saudi officials are touting the visit as being aimed at bolstering investment and business opportunities between the two allies, Prince Mohammed, known by his initials MBS, is also pushing for tougher measures against the Iranian regime. In a CBS interview ahead of his trip, the crown prince said that if regional rival Iran is left to its own devices and allowed to build a bomb, Saudi Arabia will have no choice but to do the same. His comments came just one month ahead of the next deadline by the Trump administration to re-certify the Iran nuclear deal to Congress. 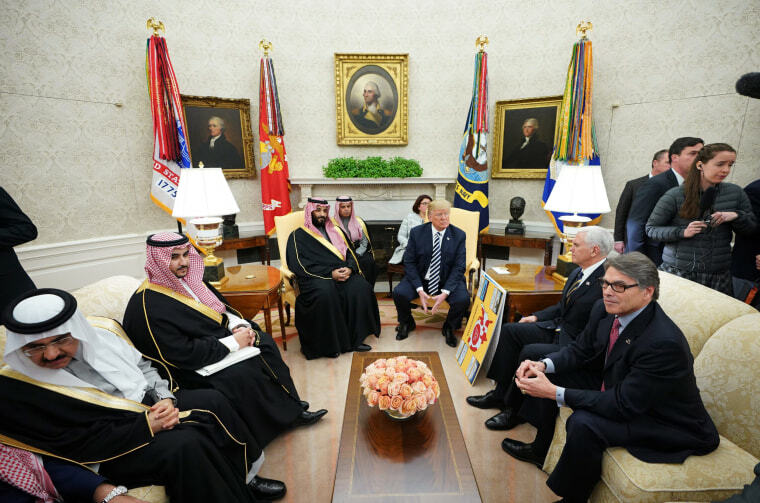 Energy Secretary Rick Perry traveled last month to London to discuss a deal that would allow the U.S. to sell nuclear reactors to Saudi Arabia. The discussions addressed so-called 123 agreements under the Atomic Energy Act, which contain a set of nonproliferation conditions on how the partner country maintains U.S.-obligated items. The agreements include conditions that require assurances of peaceful use and prohibitions on uranium enrichment and reprocessing of spent fuel. By law, the U.S. cannot sell nuclear reactors to foreign buyers until those countries agree not to enrich. Saudi Arabia has long been reluctant, insisting that uranium enrichment is a matter of national sovereignty. Perry sat next to the president during a working lunch at the White House. Other senior Trump administration officials in attendance included Chief of Staff John Kelly, national security adviser H.R. McMaster, Jared Kushner, incoming Secretary of State Mike Pompeo and outgoing director of the National Economic Council, Gary Cohn. Trump lauded the young Saudi leader. "You were the crown prince” during your last visit, he said, “and now you are beyond the crown prince." While Prince Mohammed has been hailed as a reformer who's expanded women's rights in one of the most restrictive countries in the world, he has also faced criticism for a fierce crackdown on potential royal family rivals. U.S. officials told NBC News earlier this month that intelligence shows the crown prince has even blocked his mother from seeing his father, King Salman, for more than two years. The president and administration officials have touted renewed close ties between Washington and Riyadh since Trump took office. Kushner, Trump’s son-in-law, is said to have formed a close bond with the young Saudi prince and is believed to have orchestrated Trump’s trip to Saudi Arabia, making him the first president to visit a Muslim country for his maiden overseas voyage. Kushner will host MBS for dinner Tuesday night to discuss the Arab-Israeli peace process, according to a Saudi government statement. Saudi Arabia publicly condemned the decision by the Trump administration to recognize Jerusalem as Israel’s official capital. Saudi officials say that they continue to pressure the administration to back down on plans to move the U.S. embassy to Jerusalem, but Trump said this month that those plans are on track and a small version of the embassy will open this summer.